There’s a few different ways we go fishing for sailfish in the Florida Keys. Slow trolling live ballyhoo is one very effective way for catching sailfish in the Florida Keys. The first thing you are going to want is a set of spinning rods (3 to 4). I prefer 15 lb monofilament line on a medium action 7’ rod. Since Atlantic sailfish are thought to be the fastest fish in the ocean, reaching speeds of 67 mph, you want a reel with a capacity of at least 300 yards of line. After you have your rods and boat, you are going to need live bait. Bring a couple blocks of frozen chum and a fine mesh chum bag. Ballyhoo live on almost every reef in the Florida Keys, as well as many grass patches. If you are driving through an area and see Ballyhoo swimming by: slow down, set the anchor out, and put the chum bag in the water. I look for bait in 15’ – 30’ of water typically. The ballyhoo should swim up in the chum and work their way towards the chum bag. You can either cast net or hook and line them. If you choose to hook and line the bait you want to use 6 to 8 lb test on the bait rods with small “hair hooks”, size 12 – 14 j hooks. Small pieces of shrimp work great to catch ballyhoo. Make sure you don’t over crowd your bait wells with too much live bait, a good rule of thumb for ballyhoo is 1 - 1.5 fish per gallon (so a 30 gallon well would hold 30 – 45 live baits comfortably). Now you’re one step closer to Sailfish fishing in Islamorada! After you have your ballyhoo in the bait-well you’re ready to head out to the Reef. Our sailfish usually show up in October and stay through April. You’ll want to focus your attention on the edge of the reef off Islamorada. Most of our Islamorada sailfish will be in 75’ – 175’ of water. You can slow troll, (motor in and out of gear), and change depths till you find where the fish are coming through. You can also drift a little bit, but be careful not to let all the lines get tangled. I consider trolling slow 1 to 2 knots. This will help ensure the lines stay straight behind the boat, reducing tangles. When Florida Keys Sailfish Fishing, I typically fish 3 to 4 rods, with 2 in the out riggers and 1 or 2 on the flat lines. I use a double line (either a spider hitch or a Bimini twist) about 2’ long and tie on a 15 foot, 40 – 50 lb test monofilament leader. On the leader I use a 6/0 – 7/0 non-offset circle hook. At the eye of the hook I also attach a 2-inch piece of copper wire. I put the circle hook downwards through the lower jaw of the ballyhoo, and then wrap the copper wire down the shank of the circle hook, around both the ballyhoo beak and hook shank. You’re also going to want a piece of copper wire attached to the foot of your spinning reel, about 3-inches long. When you set your rods out you want to fish with the bails open, making a bend in the copper wire by the reel to hold your line. That way when you get a bite the wire straightens out and the sailfish will have a chance to swallow the bait, getting free line with no resistance, before you set the hook. After the fish eats the bait, wait 3 to 4 seconds, close the bail, and start winding steady when catching sailfish in Islamorada. When the drag starts to come off the reel, lift the rod tip up slowly. Don’t yank back to set a circle hook! They need time to come out of the fish’s stomach to set in the corner of the sailfish’s mouth. If you hook a sailfish watch your other baits because many times there’s more than 1 fish back there. If you hook 1 fish be ready for more! You may have to chase down your sailfish with the boat too, if that’s the case you’ll have to wind up your other rods. There’s always a few lobster and crab traps out on the Reef during sailfish season, so keep your eyes out so you don’t get tangled in them. You don’t want to lose your sailfish when fishing for sailfish in Islamorada because of a trap line! When you get the sailfish by the boat grab the leader and take a few pictures of the fish in the water. It’s best to keep the fish in the water, but if you want a picture holding up your trophy just do it as quickly as possible. Many people do more damage to the fish trying to remove the hook then letting the saltwater and air rust the hook out. Most of the time it’s a safer bet just to cut the leader as close to the hook as possible and leave in the fishes mouth. However, if you can see the hook and you have control of the fish you can remove it. If the fish is tired out, you want to revive the fish. Hold the fish by the bill next to the boat, going a couple knots forward and drag the fish with you to get water and oxygen running through his gills. After the fish looks lively you can release him. We want to keep Islamorada Sailfishing a healthy Fishery. 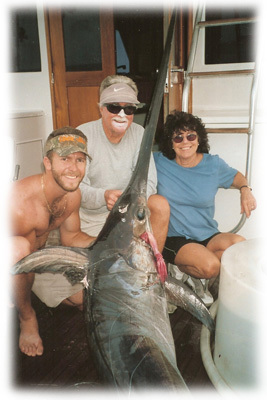 One sure way to learn how to catch sailfish in Islamorada is to book a charter at Bud n’ Mary’s Marina, and then you’ll have nothing to worry about on your Islamorada Sailfish Charter!